Kale’s bedroom is finished and his room is pretty darn cool, just like that sweet little dude that he is. This room is welcoming and fun, grown-up and light hearted, both cozy and cheerful. Although the room was a spare room before, it was a blank slate. I had just given it a fresh coat of white back in the summer and it’s always had a good feeling to the space with it’s large window. My initial Idea for the space was inspired by my friend Bre and her beautiful Nursery. I knew I wanted a board and batten wall and immediately fell in love with this wallpaper as soon as I saw it! That was my whole jumping off point! It’s such a fun space and is very age friendly with years to grow. This room is a mixed salad for all décor styles I love! I threw in some Mid century, industrial, tossed in some Scandinavian and vintage! 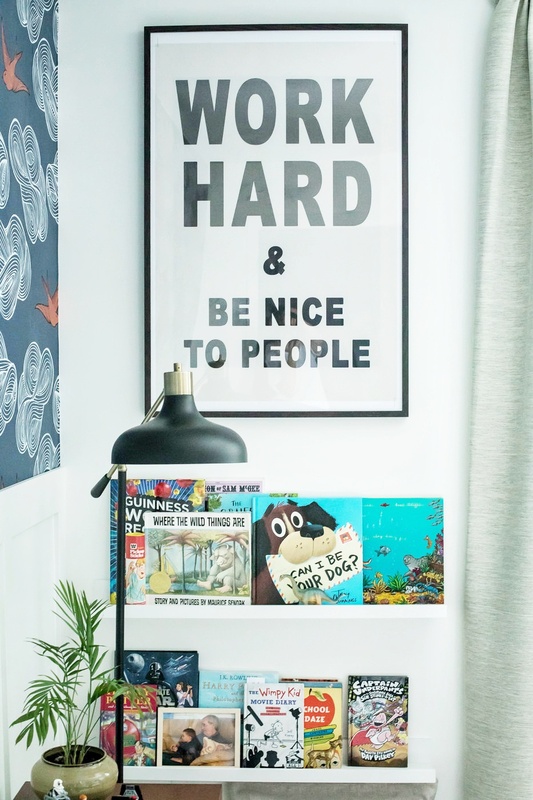 When it comes to a kids space I find it’s more forgiving to pull off a fun look and really experiment! I have a few rooms left to do in my home, and I’m like “this is so not Instagram worthy!” but this room is probably my FAVE so far! When Kale asked for his own room just a couple days after I finished the bunkroom I was pretty proud of his independence and really wanted to celebrate it. Kale and Liam have always shared a room so this was a very big deal! Kale has coped well with the change, Liam’s little heart is broken. Poor peanut! Anywho, as soon as I saw this wallpaper I pulled together this moodboard. I love this mood board and so glad I stuck with the plan. The look and feel of the space is still very much the same although there were some slight changes. The dresser is from Crate and Barrel but I was lucky to have found a vintage dresser set on Kijiji and the long dresser was perfect for the space. The platform bed we built following the original design of our bunkbeds and they turned out so well! The rug I changed to a much more graphic design. The wallpaper was the biggest Inspiration for the whole room and the DIY board and batten wall really adds some character to the space. Such a SPECIAL Wallpaper. The deep blue background with those orange vermillion birds and the crisp white modern clouds has such a huge impact! It has so much personality and depth. I like that it isn’t too juvenile crossing all the T’s for me!!! THE RUG…Yes that rug is something else! The flat weave is perfect for kids and the graphic pattern has that modern Scandinavian element to it that looks so good. What did you say? How are you going to keep the rug clean with all the white? No food, drinks and keep watch I guess…the nice thing is it is very lightweight so it would be very manageable to bring to the drycleaners. Now the DIY BED talk. So if you have been following along you know that Mike and I built our Bunkbeds. (Promise both tutorials coming soon!) 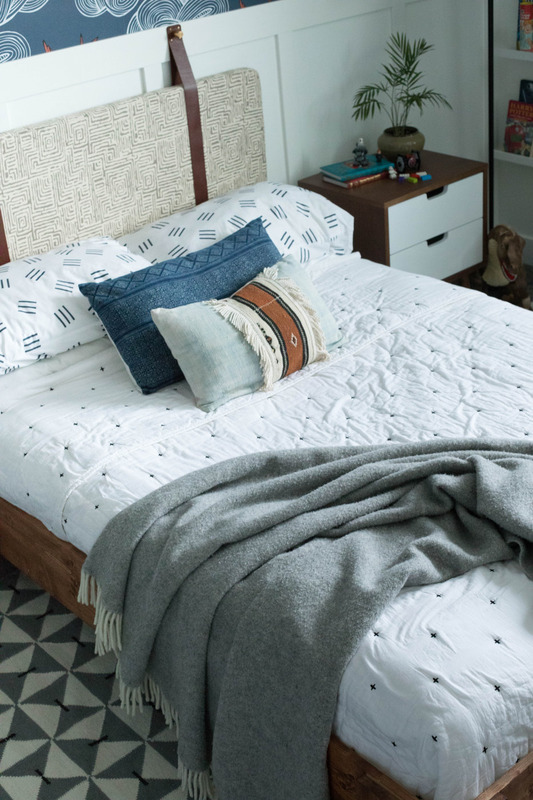 We have always loved a good DIY and when it came down to choosing a bed for this space we chose to design a platform bed following the design from our bunkbed. It is really quite simple and can be easily built in an afternoon. For the headboard I had a custom wall hung headboard made by Norwegian Wood Online. The cognac leather straps add such an unexpected detail that I love and goes so well with the rest of the room. The dresser was a score I found on the Kijiji. It also came with a tallboy that I have used in the bunkroom. It was the perfect scale for the room. This piece is timeless so it’s great for Kale to continue to use for many years to come. 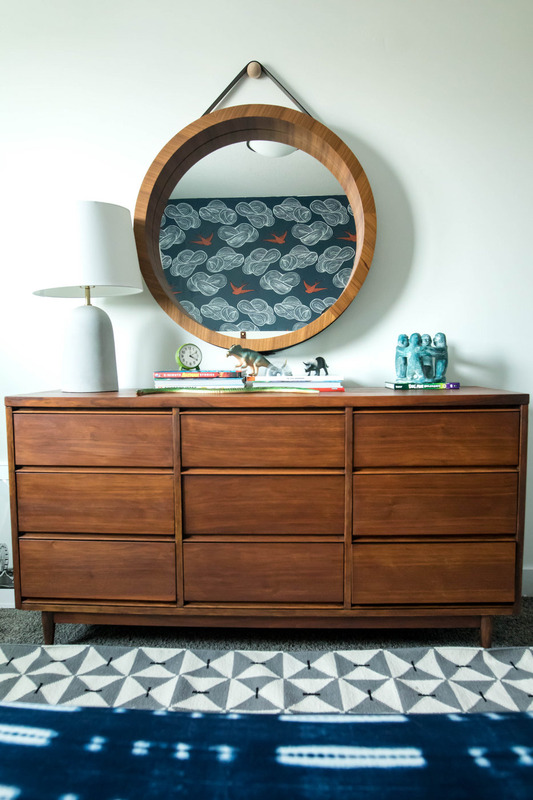 That beautiful mirror is from Renwil and I love how it adds Interest to an otherwise usual mirror for a dresser. Fits just right. Please stare at that rug some more. The Renwil task light is perfect for bunky time and reading. It’s a classic look and has great function. The cement lamp on the dresser is also from Renwil. This lamp I found was perfect for the dresser adding a softer light on the opposite side of the room. I like how it adds a new texture and a nice cool balance to the warm teak wood. I have always been a big fan of typography and what a perfect reminder to such a young mind. This one I downloaded from Etsy and then had it printed. You can buy the original from School House Electric which you can buy framed or unframed. The book shelves I used from a couple I had used in another space from IKEA. I cut them to custom fit the wall and voila! Do you ever get something and know you will never change from buying it your whole life? Like you must have Kraft Dinner Macaroni or Heinz Ketchup? Well Brook Linen is that for every bed in my house! Mike and I have there bedding for our Master, the bunkroom and now Kale’s room. The sheets are very comfortable and soft. I even find them temperature regulating, which is key in Edmonton weather. I love that they are 100% cotton and hypoallergenic. Lots of beautiful, fun and contemporary designs too for any bedroom décor. PS Attention all designers: Lightning speed delivery too! That gorgeous pillow in the front is from a very good friend and designer Abbie A. Naber Design. A Simple Meandering. I love Elisa’s work. Her pieces exude happiness and so naturally it has found a home in here. This piece is called “Living Large” and is a fun shot of the Santa Monica Pier. Elisa has a quote for this piece that says “Living is one of the rarest things in the world. Most just exist.”- Oscar Wilde That just makes my heart sing and really strikes a fire inside me I want to light for my kids. Beautiful! 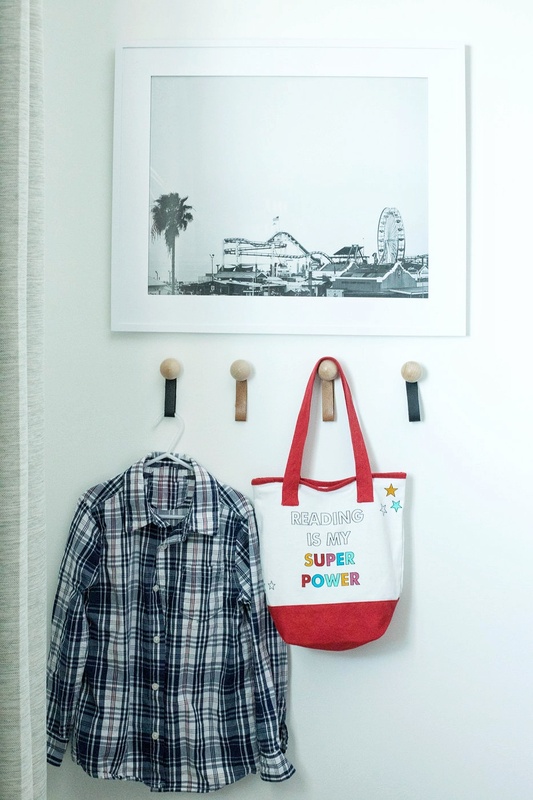 Loving those wall hooks too that my photographer and designer Ruby Thursday Collective whipped up on the fly for the shoot! Seriously so good! Hitting the shop soon for all of you too! There’s my snuggle bug doing what he does best! So that wraps it up! Kale’s Modern, Vintage, charming big boy’s room. I am so happy with this space and most importantly he loves it too! Here are all the sources so you can get the look! 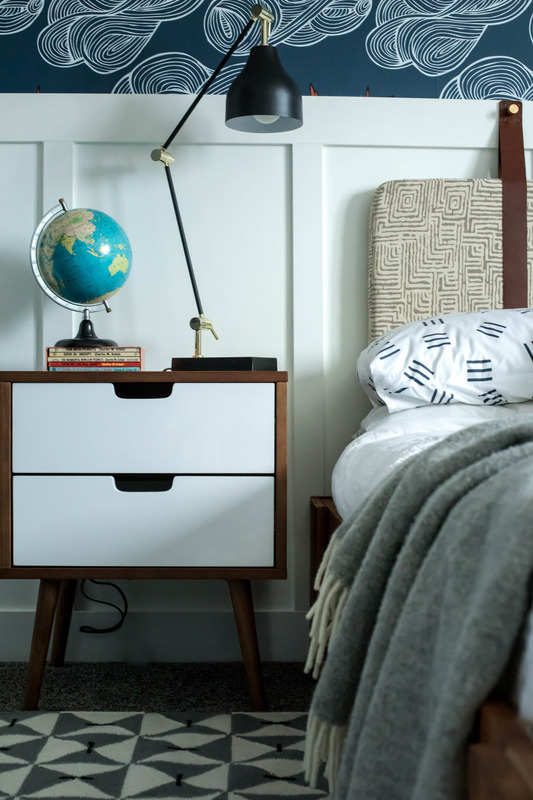 Thank you to Hygge And West , Brook Linen , Renwil , Ruby Thursday Collective Nordic Knots and A Simple Meandering for providing product for this post and helping my vision of Kale’s Big Boys Room come to life!